With the 2017 college football season officially coming to a close, we find ourselves in a familiar place: a new coach, recruiting momentum, and a newfound hope for what the future will hold. The Ducks relied on many underclassman in the 2017 campaign, but there will be some big spots to fill due to some familiar faces moving on to the next level. So this begs the question: What is the best case scenario for Oregon’s depth chart next season? The following predictions are based on current Oregon players and recruits who signed during the early signing period. I will not be speculating on potential recruits and will be playing the role of Mr. Optimist in this scenario. So here we go. 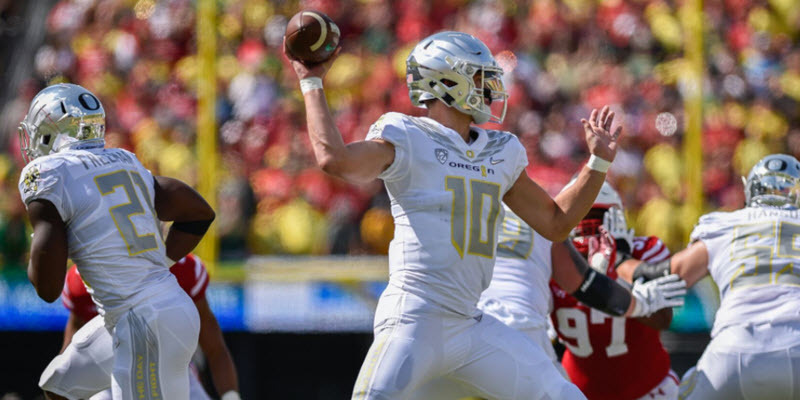 Quarterback: Oregon’s 2018 season begins and ends with the health and development of quarterback Justin Herbert. We know it, our opponents know it, and NFL scouts know it. The biggest question for this spot is who will be taking the second team reps between Braxton Burmeister, Tyler Shough, and potentially Demetri Burch. In my opinion the best case scenario is for Burmeister to develop into a solid backup for 2018. We’ve all seen what throwing a true freshman to the wolves looks like in both the 2016 and 2017 seasons and, though it works out from time to time, I believe it is best to have Shough take a redshirt year and enter the 2019 quarterback competition full of confidence. Let’s face it: if Herbert stays healthy he is playing on Sundays in 2019. 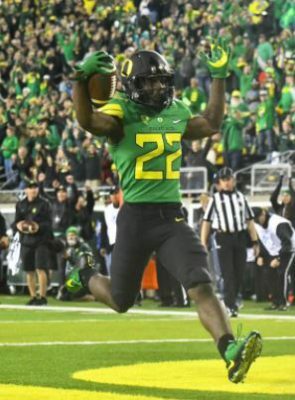 Running Back: It’s been a long time since Oregon has had this big of a question mark at the running back position. The veteran Tony Brooks-James has had an up-and-down career so far and has mostly seen time as RB3. Oregon signed three running backs in the 2017 recruiting class and two more in the 2018 class with Jamal Elliott expected to enroll early. Darrian Felix saw some (surprising) playing time this season, making you believe the staff saw something they liked, which led them to burn his redshirt. With all that in mind, my best case scenario is playing for the future by giving the young guys the opportunity to step up and provide the stability we’ve become accustomed to for 2018 and beyond. We will likely see running back by committee in 2018. Wide Receiver: We are in desperate need of a WR1 in 2018, and I don’t see one on the roster currently. We need the 2018 recruiting class to come through here. When was the last time Oregon fans could say, “Ok it’s third and long. They just need to throw it up to ______ and let him make a play?” Jeff Maehl maybe? I like Dillon Mitchell and feel like he was grossly misused in 2017. He is a YAC (yards after catch) guy. Get him the ball quickly and let his short area quickness take over. Johnny Johnson III, Brendan Schooler, and Jaylon Redd showed flashes this season, and we should all be hoping that Daewood Davis will develop into the deep threat he’s destined to be. For this unit to really be what Justin Herbert needs it to be, we must find a strong contributor in the 2018 class. Tight End: Oregon is very thin at the TE position, but starter Jacob Breeland is an excellent weapon as a receiver. With Breeland returning, the biggest issue for this group is depth. Cam McCormick has struggled on the field, being noticed for mistakes (penalties, drops, missed blocks) more than big plays. I’m not ready to give up on McCormick, but I believe the best case for this position is to have a 2018 recruit step into the second slot. Offensive Line: Oregon should only be replacing two starters in 2018 in Tyrell Crosby and Jake Pisarcik. The rest of this group is strong, and I wouldn’t expect too much change in 2018. At left tackle, Oregon’s best hope is with last year’s JC transfer George Moore. At right guard, I’m hoping that one of the big (and I mean huge) 2018 recruits will step up. I wouldn’t be surprised if Calvin Throckmorton (graded very well as a pass blocker in 2017) slides over to LT and Moore starts at right tackle, making the right side very intimidating (beefy!). Either way, I expect this group to remain a team strength. 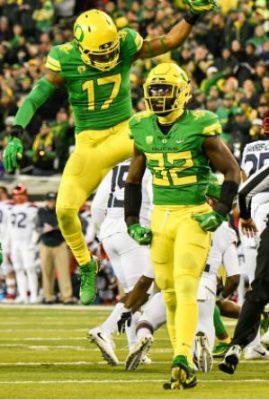 Defensive Line: Oregon received great news when Jalen Jelks decided to return for his senior season, shoring up Oregon’s pass rush for 2018. Oregon will have to replace Senior Henry Mondeaux who served as an anchor along the line and freed up guys like Jelks to beat opponents one on one. Personally, I would love to see the tandem of Jelks, Jordon Scott, and Austin Faoliu on early downs, where Faoliu takes the role of Mondeaux in shoring up one side of the line. On passing downs, I’d love to see 2018 JC transfer Sione Vea Kava line up opposite Jelks, with either Faoliu or Scott manning the nose tackle spot. RS sophmore Hunter Kampmoyer is also a guy who could step into the Mondeaux role, along with RS freshman Popo Aumavae stepping into the backup NT role for 2018. Linebackers: This group is the most difficult for me to predict. A big part of me really wants to see Troy Dye move back to his natural position as an outside linebacker (a move I feel will improve his draft stock), but I also believe there are fewer unknowns on the outside than at inside linebacker for next year. The play of Justin Hollins and La’Mar Winston over the course of the year was good enough to solidify their starting spots for next season. So who plays next to Dye on the inside? My vote is for the Sampson Niu to step into that spot next season. Kaulana Apelu played admirably until his injury early in the season, but he is undersized, and I think the defense is best served with him as a situational player. Behind the starters I would love to see Bryson Young and Adrian Jackson develop into strong rotational players. Bryson got a tough shake this season when the defense switched back to the 3-4. He is a much better fit as a 4-3 DE, but I believe he can find success as a situational pass rusher, and if he is able to develop his cover skills, watch out. Adrian Jackson has the look of a Power 5 player already and is a guy Jim Leavitt really went after, which bodes well for him seeing the field this season. Cornerbacks: This is an easy group. 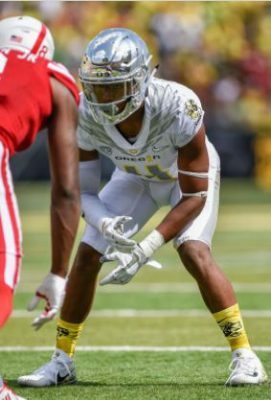 Thomas Graham and Deommondore Lenoir are the future here, and their development is vital to the Oregon defense moving forward. The third corner spot is a little tricky, but I think in the best case scenario Ugo Amadi slides back into this role as a stopgap for this season. Newcomers like Haki Woods, Verone McKinely III, and Jevon Holland could make a run at the third spot, especially as the season progresses, but I think the best case for this group is having the veteran presence. Safety: This is a group from which I expect to see some younger guys really emerge this season. This group looks like it will have stiff competition through the spring and fall practices and may not be set until game week. The one player I think is a best case scenario starter for next season is Nick Pickett. He is the most physical and hard-hitting member of this group, and I liked what I saw from him in 2017 before his injury. 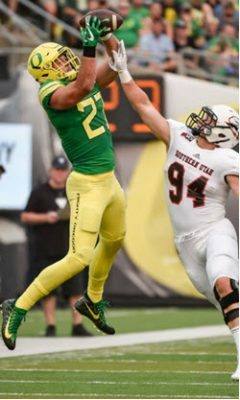 For the other safety spot, I’m going with the Oregon kid, Brady Breeze, to step up in his RS-SO season and act as a field general for the back of the defense. Both of these guys look like smart, hardworking football players that Duck fans can be proud of. Billy Gibson should be a strong rotational player, and we should all be very excited about the newcomers Steve Stephens and Jevon Holland, who will push the older guys for playing time. The future looks very bright at safety. So there you are, my picks for the best case Oregon depth chart. I’d love to hear your thoughts on my lineup or see yours in the comments. I hope everyone is as excited about the future of Oregon Football as I am!